You do a lot of things for your kids to keep them safe that they are probably not even aware of. When they were just learning to walk, you made sure there were no sharp corners for them to stumble into. You always take the time to fully strap them into their car seat. You even make sure to drop them off at a certain spot at school so they are completely protected from traffic. These little things help give you peace of mind day to day. Did you know you could do the same for their teeth with dental sealants? Your dentist in Birmingham, Dr. Angelica Rohner, lets you know how this small step could help save your kids from getting cavities. Teeth are very complicated structures, and this includes your child’s baby teeth. Each one is composed of 3 different layers and serve a specific purpose in their mouth, whether it comes to speaking or eating. The back teeth in particular are complex. They have many small, tight grooves that help them grind food to the point that it is easy to swallow. Unfortunately, it is easy for many children to miss them while brushing their teeth because they can be difficult to reach. Many parents are happy when their kids are just willing to keep the toothbrush in their mouths, let alone reach it all the way to the back. Due to these factors, 88% of children’s cavities develop in their back teeth. This is especially troublesome because tooth decay can be very hard to see in this part of the mouth. Once a toothache sets it, it can be especially painful because children will still try to chew with the infected tooth. Dental sealants are specifically aimed at protecting this sensitive part your children’s teeth. A dental sealant is actually a simple resin that is applied to your children’s back teeth to protect them from bacteria and food particles. They are specifically meant to shield the small crevices that are in constant contact with food and are difficult to reach when brushing. It is just an extra level of protection while they are still learning how to brush. A dental sealant can be easily applied in one visit to our office, and the procedure is entirely painless. Dental sealants have been shown to dramatically reduce the amount of child cavities and can last for several years. 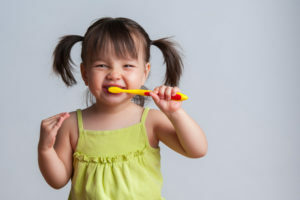 The dental sealant procedure can also serve as an important learning moment for your children, as it can bring their attention to the back teeth they so often miss when brushing. You can have your child easily get dental sealants at their next regular check-up. You care so much about your child that you’re willing to do anything to make sure they are healthy and happy. Dental sealants are one of the easiest ways you can do that. If you have any other questions about dental sealants or anything else having to do with pediatric dentistry, please don’t hesitate to call us today.